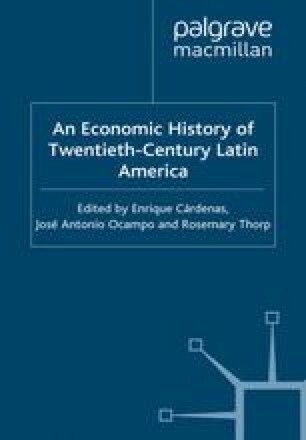 The objective of this chapter is to present an evaluation of the process of industrialization of Chile during the period 1940–82. The concept of industrialization is understood in the broadest sense, including industrial development as well as institutional modernization and social transformation. During the four decades which elapsed from the beginning of the 1940s, the Chilean economy completed a cycle of its economic development and began a new phase. The cycle of the so-called ‘development from within’, which had begun with the 1930s crisis, culminated in 1973–74 with the breakdown of the democratic regime.1 Throughout the decade of the 1940s the industrial growth rate reached an average of 8 per cent a year but thereafter declined perceptibly (Munoz, 1995). For the entire period 1950–71, an annual growth rate of 5.4 per cent has been estimated, well below the Latin American average for this period which reached 6.7 per cent (Benavente et al. 1996, table 4). Originally prepared for the project on ‘Industrialization, the State and Economic Development in the post-Second World War period’, sponsored by the IDB and coordinated by Rosemary Thorp. We acknowledge the guidance of Rosemary Thorp and the observations received in the workshops which took place in Oxford in September 1996 and in Paipa in May 1997. This work draws extensively on previous articles by the authors.